Full details have been published about the special editions of The Stone Roses debut album, released to mark it’s 2oth anniversary. 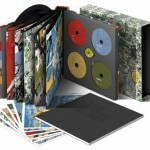 On 10th August Sony Music re-release the classic album in 3 new formats. A super deluxe 12″ album folder, slipcased with embossing and gold foil. 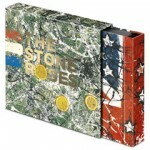 Wrapped in classic John Squire artwork throughout. 3 x 180 gsm heavyweight vinyls. Lemon shaped USB containing all audio, previously unseen John Leckie home video footage of the recording of Fools Gold, promo videos, ringtones, wallpapers AND 5 previously unheard ‘Backwards’ tracks. 48-page bound book, crammed full of unseen photos and brand new notes from the band, John Leckie, those involved 20 years ago and high profile fans of the album telling their stories of it, including Noel Gallagher, Mark Ronson, Tim Burgess, Bobby Gillespie and many more. the 3rd pack is a bit pricey but its definitely the one. lets hope the chart position or the £250,000 the band are getting convince them theyre still adored. this is the band who changed my life – from the clothes i wore to the people i hung around with and ultimately made me the person i am today, and the world still waits…. Jamie – you can order from Amazon.co.uk – their worldwide shipping is exceptionally reasonable and probably only around 3 pounds. The 8LP Oasis box set from Amazon quoted me 3 pounds to ship across the Atlantic to Canada, actual postage would have been at least 5 times that I’m sure. Regarding availability in Australia, is the Uk edition DVD multi-region (if I were to order through amazon.com.uk)? On the way back by the grace of God!!!! This is actually a fascinating weblog, lots of stuff that I can get into and i all the time stumbled to be right here when reading the weblog posts.